What is Fluidotherapy is used for? Fluidized therapy (Fluidotherapy) is a high-intensity heat modality consisting of a dry whirlpool of finely divided solid particles suspended in a heated air stream, the mixture having the properties of a liquid. In addition to the superficial heat, it provides tactile stimulation while also allowing for active range of motion. Studies comparing its effective heating with that of a paraffin bath and whirlpool have found them to be similar. 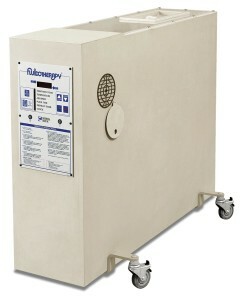 The indications for fluidized therapy are similar to paraffin baths and whirlpool. 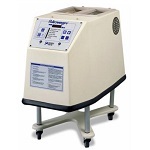 Use of fluidized therapy dry heat is an acceptable alternative to other heat therapy modalities in reducing pain, edema, and muscle spasm from acute or subacute traumatic or non-traumatic musculoskeletal disorders of the extremities. Fluidized therapy is contraindicated in patients with local sensory loss, open lesions, severe circulatory obstruction disorders (eg, arterial, lymphatic or venous disorders) or systemic infectious diseases. Calibration and adjustment of the Fluidotherapy are crucial in order to safely and accurately use the equipment on the patient. It must be done regularly for the best results. We also provide repair and replacement of any electrical and mechanical parts. Worn motor, heater, wiring and electronics after prolonged use.